This low back executive office chair from Global is rated for 24 hour intensive or multi-shift use and is available in your choice of top grain black leather or commercial grade, stain resistant fabric upholstery. 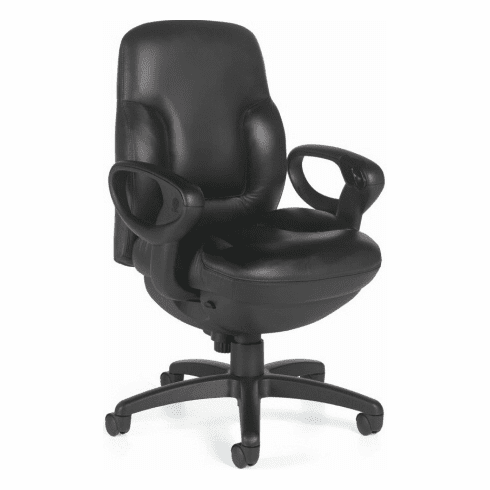 This executive office chair features multiple ergonomic adjustments including a seat slider to accommodate big or tall users. Other features include thickly padded and properly contoured cushions, synchro-tilt movement with tilt lock and tilt tension adjustment, pneumatic seat height adjustment, back height adjustment, rated for users up to 350 lbs., waterfall seat edge helps to promote circulation to legs, width adjustable loop arms, easy reach push button controls on armrests that modify seat height, angle, tilt and tilt lock and a reinforced five star molded base with dual wheel hooded casters. Concorde's low back office chairs meet or exceed ANSI/BIFMA standards. Dimensions: Seat Size: 21"W x 19"D. Back Size: 21"W x 20-23"H. Seat Height Adjustment: 18 -22"H. Overall: 40"H x 28.5"W x 27"D. Limited lifetime warranty from Global. This chair is custom made and normally ships within 4-5 weeks.